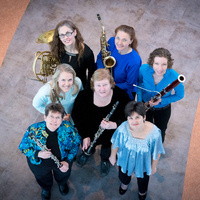 The Wake Forest Department of Music presents the Women Winds Ensemble (WWE) in a guest artist recital, performing an eclectic program with music by Antonio Vivaldi, Astor Piazzolla, Arthur Bliss, and Darius Milhaud, as well as "Rosie the Riveter" by Robin McLaughlin, a new work commissioned by the WWE. The WWE was formed in 2017 with the intent to showcase various combinations of small and medium-sized wind chamber ensembles. WWE has created an opportunity for both new and long-time friends and colleagues to collaborate in the presentation of both classical standards as well as new works created for our ensemble. Comprised of all female musicians, the WWE embraces opportunities to feature works by women composers and to encourage both young girls and boys to find their own creative voice. Members of the WWE are Erika Boysen, flute, Ashley Barret, oboe, Kelly Burke, clarinet, Rebecca Libera, bassoon, Susan Fancher, saxophone (Wake Forest University saxophone instructor), and Abigail Pack, horn.